Ride-On TPS (Tire Protection System) is a tire balancer and sealant compound that evenly coats the inner surface of your tires. 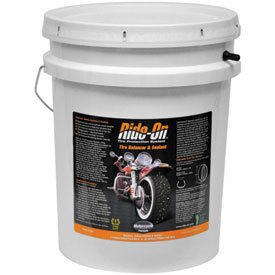 This coating balances your tires and makes them into self-sealing tires while you ride. Eliminates need for those old ugly wheel weights. 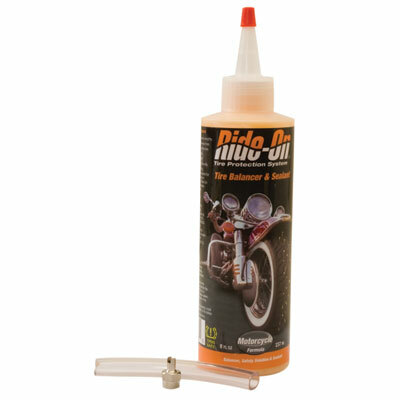 Ride-On is specially formulated to hydro dynamically balance high-speed tires; dampen road noise and vibrations that cause a rough ride. If your tire is punctured, the centrifugal force of the rotating tire and the internal air pressure force Ride-On into the hole, sealing it instantly (up to 1/4" in tubeless tires and 1/8" in tube tires). Ride-On is a green biodegradable product that is designed to be non-hazardous and non-flammable, and contains corrosion inhibitors that protect all alloys of steel, aluminum, magnesium and yellow metals against oxidation. Note: After installing the Ride-On Tire Balancer & Sealant into your tires you may notice a slight vibration until the sealant has warmed up and distributed evenly in your tires. This process usually takes 2-5 miles. Please DO NOT attempt to rebalance tire's after the installation of Ride-On Tire Balance & Sealant. Ride-On will act as a balancer and will result in erroneous readings from a dynamic spin balancer.